Some common questions about acupuncture are answered below. 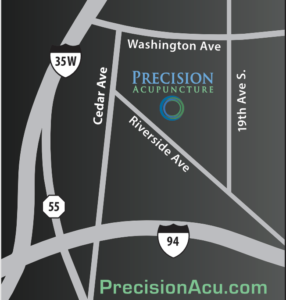 Call us if you have other questions or simply want to expand the discussion on how acupuncture would improve your life. We are happy to check on your health insurance acupuncture benefits for you. We are in network with Blue Cross Blue Shield, Medica, UCare, Hennipen Health, Veterans Affairs, & Minnesota Health Care Programs. We accept Auto Insurance for injury care due to a Car Crash. We accept Workmans Compensation insurance for injury care due to a work related injury. If you have an injury related work or a car crash, your insurance will most likely cover your care 100%. The VA insurance covers the Acupuncture care 100%. Medical Assistance Plans cover acupuncture. Many health insurance plans have acupuncture coverage for pain conditions, sometimes they have coverage for other conditions as well. With out any insurance coverage, you will find our care plans and payment arrangements affordable and easy. You may always use your HSA, HRA and Flex dollars here. We process all of your insurance needs. Acupuncture has been found to be safe when performed by a trained professional. It is an all-natural, drug-free therapy, yielding virtually no negative side effects. Acupuncture works by activating the body’s own healing and self balancing activities. The side effects tend to be all good effects including the feeling of calmness, a sense of well-being, more restful sleep, and so on. There is very little risk of infection from acupuncture needles because the needles are extremely thin, sterile, and used only once before being discarded. Acupuncture Has Helped Millions with Countless Conditions! The needles Shane uses are so thin they are most likely nothing like any other needle you have seen before. It is hard to even call them needles. They are more like metal threads. Most of the time people don’t even feel the needles when they are inserted. The Acupuncture technique mostly used is gentle and doesn’t hurt. When acupuncture does hurt, its like a prick for a couple seconds. Why Do People Get Regular Acupuncture? Decrease mental stress, anxiety and depression. Increase mood & energy. Increase mental performance. Optimize immune system activity relieving allergies and decreasing frequency of catching cold, flu, asthma attacks, bronchitis, etc. Keep Menstruation regular and as comfortable as possible. Because it feels so good! With one treatment progress begins and patients tend to feel better but a single treatment tends not to be enough to fix a health condition. The body’s response to acupuncture is accumulative. The true goal reaching & life changing results occur from a series of treatments. The number of acupuncture treatments and the time frame of the treatment plan depends on the patients unique health condition as well as his/her goals of what state of health he/she would like to be in. At your first visit Shane will listen to your story and evaluate your health condition. He will then suggest a care plan that is uniquely designed for you to reach your goals.